UUP MLA Doug Beattie. 'Photo: Tony Hendron / Press Eye. A pension for Troubles victims should be one of the things discussed during talks to re-establish the Northern Ireland Assembly, Doug Beattie has said. 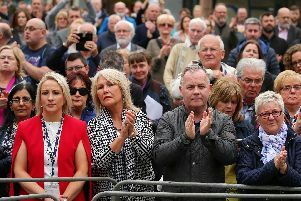 The Ulster Unionist MLA said the secretary of state should step in and legislate for pension provision if the DUP and Sinn Fein can’t agree to restore the power-sharing arrangements at Stormont. However, Mr Beattie said, his party does not believe that terrorists who injured themselves “should be given equivalence with those who they set out to kill or maim”. He said: “The issue of a pension for those who were physically injured during the Troubles has been a bitter tale for many years. It is thought that around 500 individuals would be eligible for financial support due to their Troubles-related injuries.